Vascular dementia is one of the more common forms of dementia, but how much do you know about it? Read on to learn more about vascular dementia. Vascular dementia can happen because of damage to the brain from lack of blood flow or from bleeding in the brain. One of the possible causes of this brain damage is stroke. A stroke occurs when blood flow in an artery stops, either because the artery is blocked or has burst. The damage caused by a stroke may lead to vascular dementia. Different conditions affecting the brain’s blood vessels can lead to stroke and other kinds of vascular brain damage. This brain damage may also result in vascular dementia. Two types of vascular dementia are subcortical dementia and cerebral amyloid angiopathy. When small vessels in the brain become stiff and twisted, reducing blood flow to the brain, this causes subcortical dementia. When a protein called amyloid builds up in the brain’s blood vessels, strokes or bleeding may happen which may result in symptoms of dementia. This is known as cerebral amyloid angiopathy. Someone with vascular dementia may notice changes in their ability to make decisions, plan, or organize as their first symptoms. Other changes may include difficulties with movement, such as slow gait and poor balance. Symptoms tend to appear slowly, and specific impairments may occur in steps, where the person’s abilities can deteriorate, stabilize for a time and then decline again. 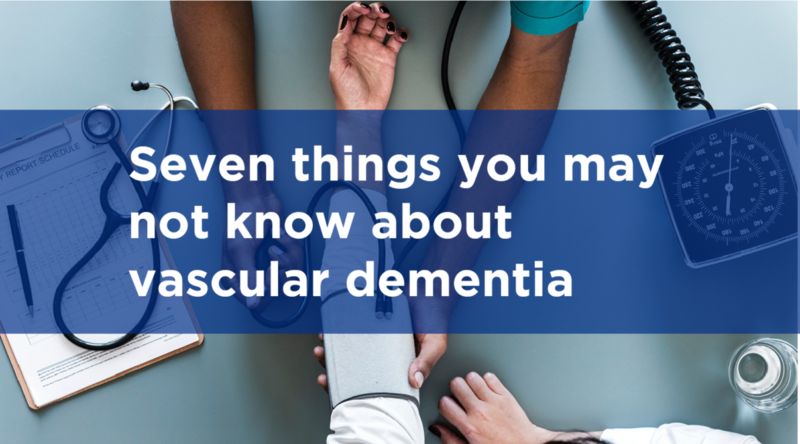 If you suspect that you have vascular dementia, your doctor will likely perform a number of tests, both physical (like measuring your blood pressure and cholesterol levels) and cognitive (measuring your judgement and planning abilities). Along with a detailed medical history, these tests will provide your doctor with the evidence they need to make a diagnosis. Strokes can be large or small land can have a cumulative effect (each stroke adding further to the problem). That’s why it’s important to learn the signs of stroke. The Heart and Stroke Foundation’s FAST campaign can help you identify when a stroke is happening. In general, controlling the risk factors for stroke can also help reduce the risk of vascular dementia. Did you know that high blood pressure (or hypertension) is the single most important risk factor for stroke and vascular dementia? It’s a risk factor you can manage, too, through physical activity, healthy eating and taking the right medication. Medications may also help control other risk factors like diabetes, cholesterol and heart disease. Since there are currently no medications that can reverse brain damage, it is important to make healthy lifestyle choices (such as being physically active or eating well) for life-long brain health. Even if you have vascular dementia, small healthy changes can help maintain your quality of life. By living a healthy lifestyle, vascular dementia may be prevented, delayed or slowed down. For more information, check out our vascular dementia page, or download our full brochure. Think you know about vascular dementia now? Take our quiz and test your knowledge! Can you get all seven questions correct? 1. True or false? If a person has a stroke, they will definitely get vascular dementia. 3. Which of the following is a symptom of vascular dementia? 4. True or false? There is no single test that can diagnose vascular dementia. 5. 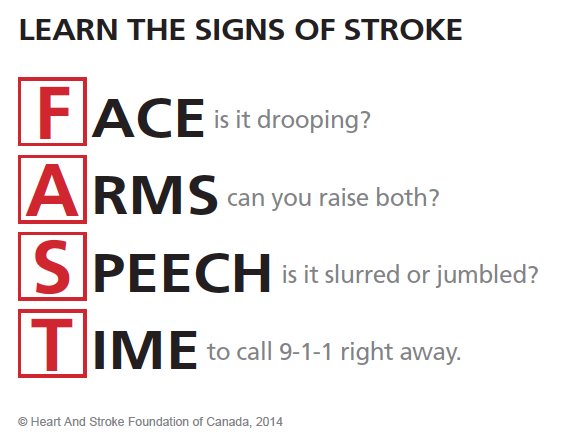 According to the Heart & Stroke’s FAST campaign, how can you identify when a stroke is happening? 6. Which of the following are risk factors for vascular dementia? 7. True or false? Having a healthy lifestyle can reduce your risk of vascular dementia. How much do you know about vascular dementia? Now that you’re familiar with the basics of vascular dementia, find out more about other dementias. Go to alzheimer.ca to learn more. You’re familiar with some of the basics of vascular dementia. Brush up your knowledge a little more, then try to get a perfect score! You’re not there yet, but you will be! Read more about vascular dementia, then try again! While stroke can increase the risk of vascular dementia, it isn’t a guarantee that vascular dementia will occur. Subcortical dementia and cerebral amyloid angiopathy are two types of vascular dementia. Small vessel disease is a condition that can cause subcortical dementia. Transient ischemic attack is a type of stroke and a risk factor for vascular dementia. A person with vascular dementia may notice a decline in ability to plan and make decisions, as well as difficulties with movement such as keeping balance. To properly diagnose vascular dementia, a doctor will have to run a series of physical and cognitive tests. Complete with a detailed medical history, only after these tests are complete will the doctor have enough evidence to make an educated diagnosis. The four signs that can identify a stroke, according to FAST, are: Face (is it drooping? ), Arms (can you raise both? ), Speech (is it slurred or jumbled? ), and Time (to call 911 right away). High blood pressure, smoking and heavy alcohol use can all contribute to the likelihood of vascular dementia. Fortunately, these are all factors that you can control! A healthy lifestyle means eating well, exercising regularly, getting enough sleep and more. Making healthier lifestyle choices can lessen your chance of developing vascular dementia.